From Outdoor Resort Palm Springs, Cathedral City, California Spectacularly good weather found us here in the Coachella Valley with daytime highs in the 70's and cool, sometimes downright cold nights. 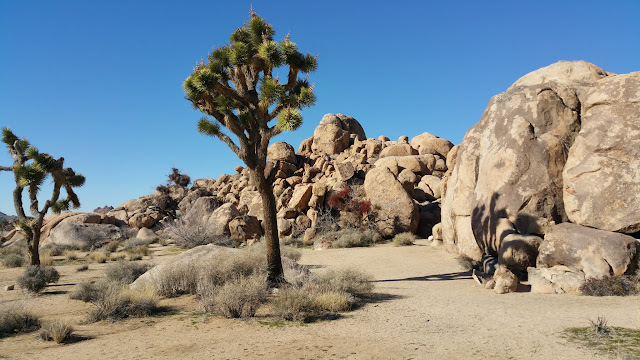 Pam, Ernie, Wayne and I took advantage of this weather blessing with a 150+ mile ride to and through Joshua Tree National Park last Saturday. We started with a Panera Bread breakfast before jumping on I-10 west to CA 62 through the Morongo Valley and then to Yucca Valley where we stopped by the Ford dealer to see a particularly nice lipstick red F-150 pickup truck. More about that later. 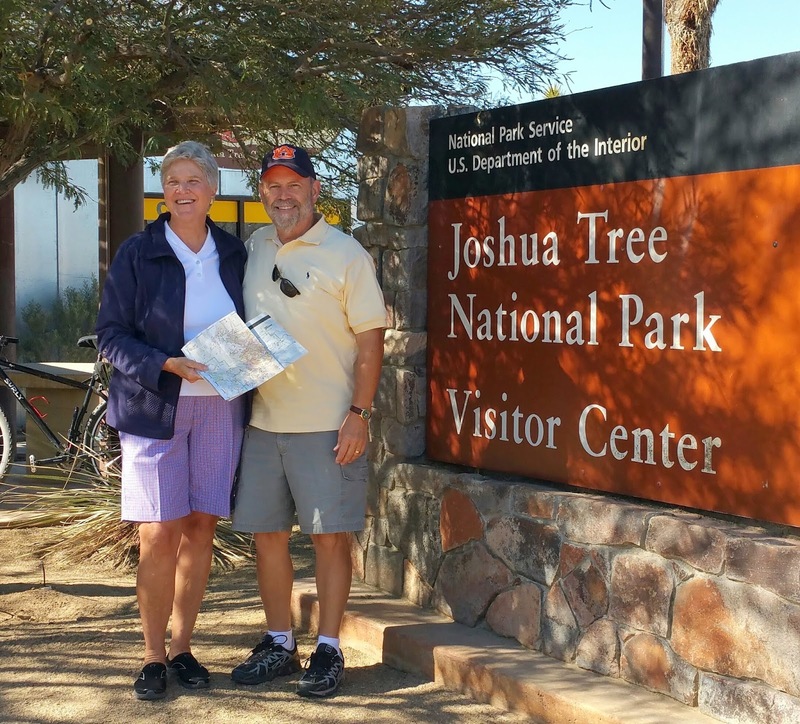 Wayne and I visited Joshua Tree National Park Visitors Center on Twenty-Nine Palms Highway during our first visit to this area in early spring 2011. On that day, though, we were finishing out a busy day trip and didn't have time to explore the park. I'm glad we've returned and can check another of America's many beautiful national parks off our list. A well-informed Joshua Tree National Park ranger offered suggestions for sights to see in the time we had allotted today. Pam and I gathered a few brochures and maps of the park. Conveniently, a sweet little deli was operating in the building adjoining the visitors center. A sign outside advertised a choice of sandwiches, chips, fruit, cookie and drink for $12. The four of us selected our individual lunch and then were on our way. The day was perfect. Outside the Visitors Center. I love these succulents. 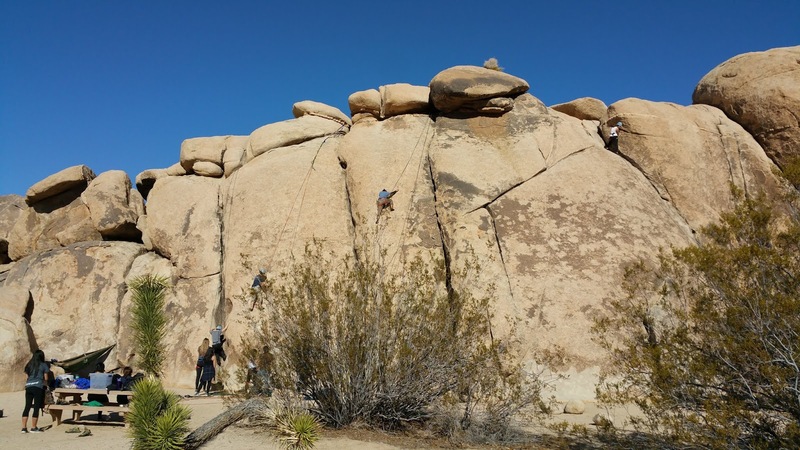 On a warm February Saturday, it came as no surprise that we would encounter slow traffic going into Joshua Tree National Park. 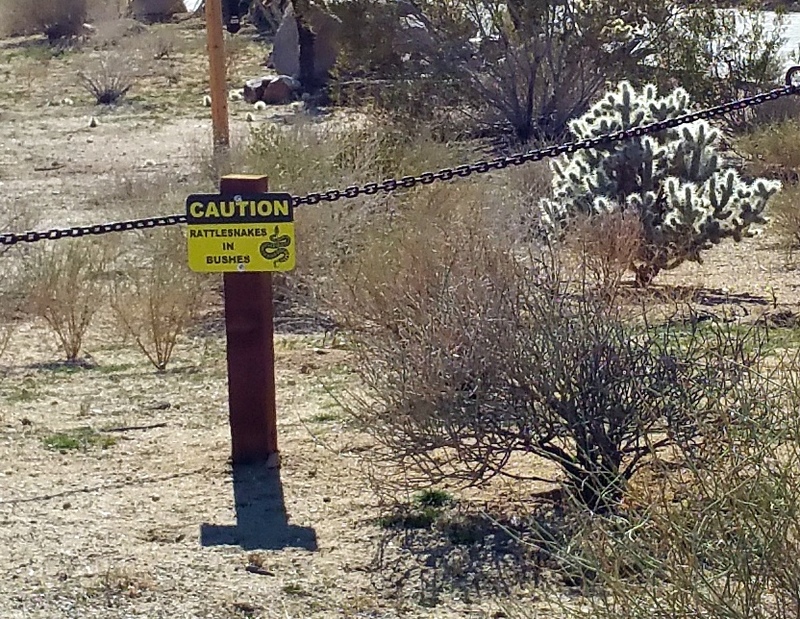 Wayne noticed the rattlesnake warning sign on the property along the road where we were stopped. Comforting. Named for an iconic plant of the Mojave Desert, Joshua Tree National Park isn't the only place this strange looking agave plant is found. 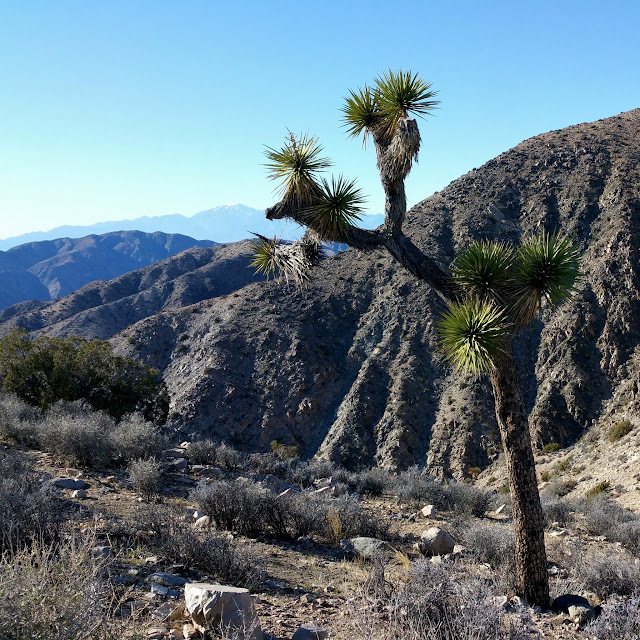 As a matter of fact, there are parts of the National Park where Joshua trees don't grow at all. As always is the case, I took several dozen pictures of pretty much the same scenery -- all trying to capture the very best shot of the most nearly perfect Joshua tree. Here are a few of my favorites. Pam has a couple dozen favorites of her own. 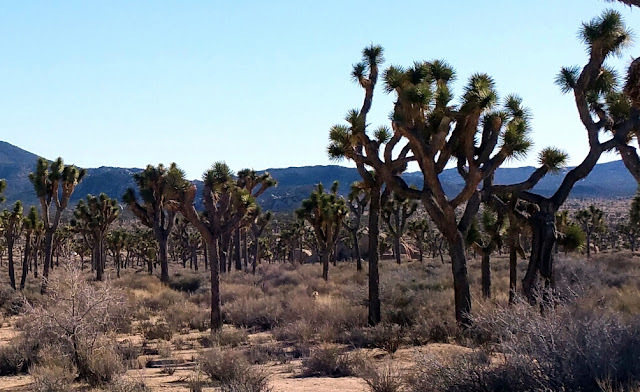 Joshua trees might have been named by have been named by Mormon pioneers who, it is said, felt the upward reaching tree branches to be the arms of Joshua leading them to the Promised Land. Following the suggestion of the park ranger, we detoured from the main road toward Keys View. 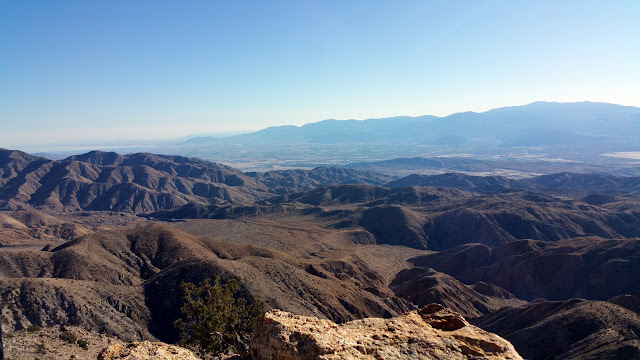 From here, we can see the Mojave and Colorado Deserts, great piles of giant boulders, the frighteningly real San Andreas Fault Line, the Salton Sea and the Coachella Valley. An bonus today, we saw several mountain goats along the nearby hillside. (They didn't show clear in the photo, so I didn't include it here.) In exchange for the awesome views, the 5,185 foot elevation presented us with a burst of cold air that we weren't prepared to receive as we stepped out of the truck. Looking across the Hexie and Cottonwood Mountains and the Pinto Basin. From the parking area to the viewing summit was about 20 yards of crisp, bone chilling cold wind. When I reached the summit, a young man suggested I hop the rock wall and sit on the other side where the wind would be blocked by the wall. He was right -- I was warm enough to sit comfortably and take a few pictures. 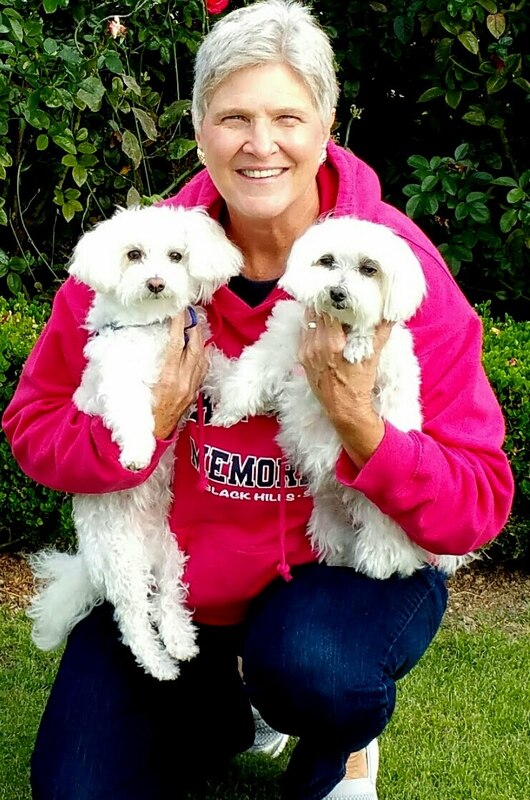 Afterward, the four of us ate lunch in the truck with one hand while holding little white dogs at bay with the other. Much too cold to eat outside but lunch was especially good despite the inconvenience. 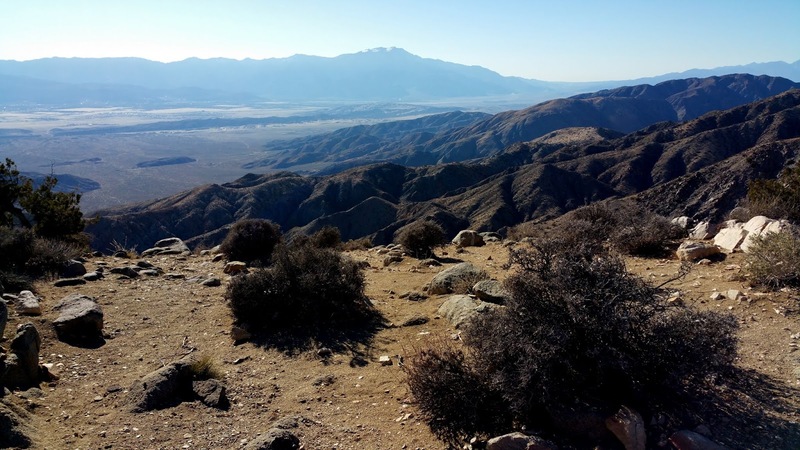 Little San Bernadino Mountains, the Indio Hills, a strip of the Mojave and/or Colorado Desert. 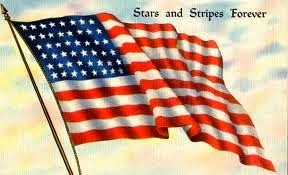 I was told that the thin dark line is the San Andreas fault line which can easily be seen in many places here. 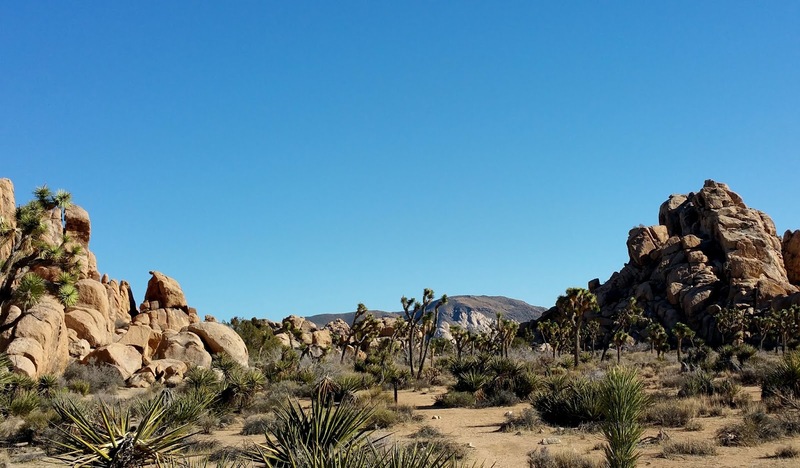 In certain places within Joshua Tree National Park, the area's giant piles of boulders and the rather fragile looking Joshua trees share space. 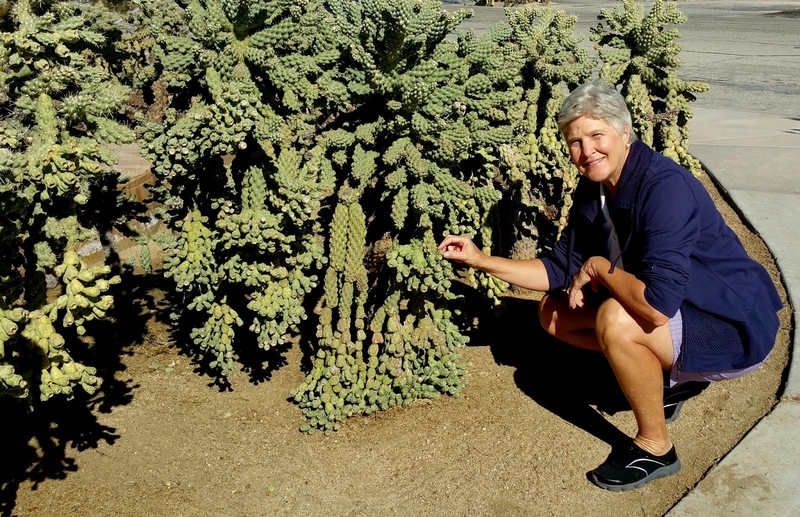 A Joshua tree may have spiky succulent leaves but it is not a cactus. They are agave plants. The trees are fibrous inside and they have no growth rings so it's tough to estimate their age. From Keys View we returned to the main park road and then into several areas of giant boulders and broken rocks. Lots of Joshua Tree park visitors come here to climb these giants. Rock climbers giving it their best shot. 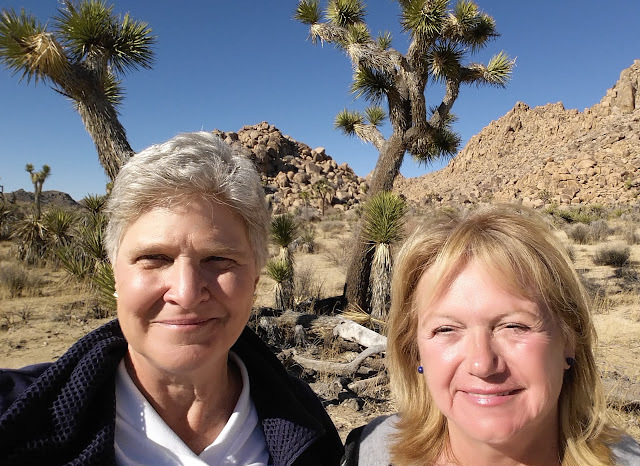 Pam and I braved the rattlesnakes to get into the heart of Joshua Tree National Park. Ernie and Wayne sat in the truck while we explored and took selfies. Girls are tougher than boys. Farther into the park we came upon areas named Cap Rock, Split Rock and then Skull Rock where, once again, Pam and I left the husbands to keep the truck seats warm while we posed artfully among the boulders. 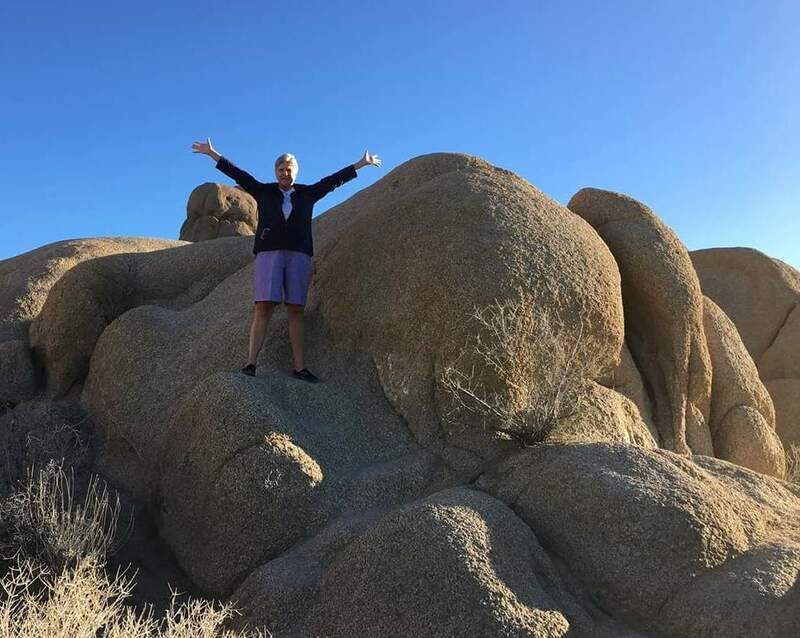 My favorite photo isn't included here as I don't have a copy of it, but Pam is striking a Pilate balancing stance among the rocks. It was cool. Feeling a bit like an explorer. There was simply not enough time to see all the sights of Joshua Tree National Park. We missed the Geology Tour Road and the Cholla Cactus Garden altogether. 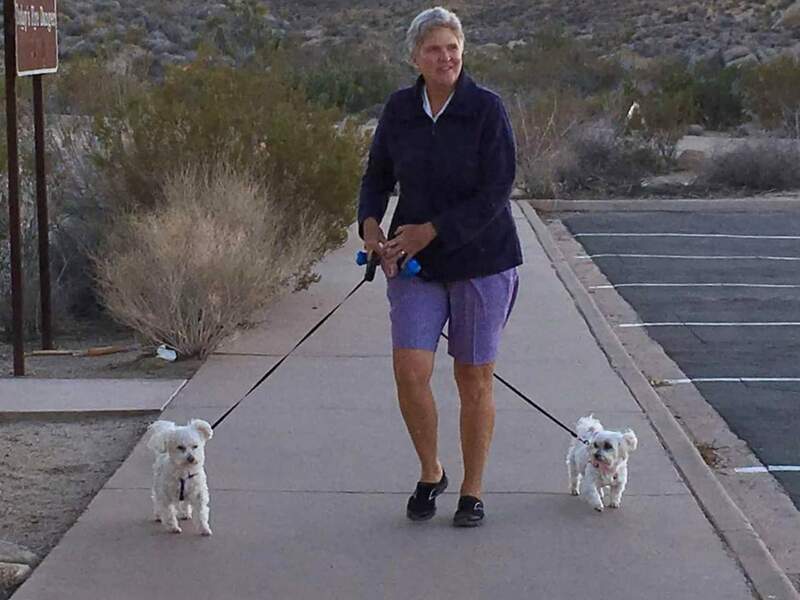 When the sun began sinking behind the mountains, the air temperature fell like a rock (ha ha ha)... and I was downright cold taking Ozzie and Lexie for a short walk around the parking area of Cottonwood Visitors Center. Soon after this photo, we were back on I-10 in route home to Outdoor Resort. What a great day. What a great life. Postscript: The cover photo for the 1987 U2 album "The Joshua Tree" was not taken in Joshua Tree National Park. It was taken somewhere near Death Valley.